Marine ecosystem models are an important analytical approach to: integrate knowledge, data, and information; to improve understanding on ecosystem functioning; and complement monitoring and observation efforts. However, there is a mismatch between marine ecosystem modelling research and what policy makers need to know. The European Marine Board will assess and recommend Research and Development (R&D) needs for future marine ecosystem modelling for evidence-based policy making. The main information from the publication is highlighted in a short Fact Sheet. The publication is also available in as a high resolution .pdf. Europe has excellent capability in Marine Ecosystem Modelling. However, there remains a mismatch between scientific research and what policy makers need to know. Therefore, a European Marine Board Future Science Brief will highlight foresight activities at European level and communicate community-driven European research needs and priorities to policy makers and wider stakeholders. The publication also takes into account key messages from an expert workshop organized on 7 July 2017 (see below). 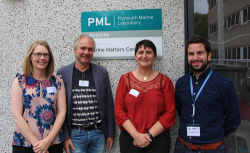 EMB Workshop on Marine Ecosystem Modelling (Plymouth, UK; 7 July 2017). The workshop was organized in association with AMEMR (Advances in Marine Ecosystem Modelling Research). Find out more details about the workshop, including the briefing paper, the agenda and the workshop summary report is also available here. The news article is here.